Caption: "Lunching behind the soup house." 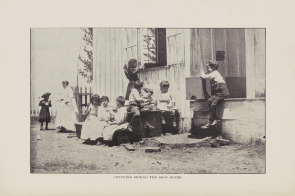 Children sitting outside at the Sanitarium Playground with the tin cans that soup was served in for lunch. A young girl is pictured peering through a window of the house.